With the holidays in the rear view mirror, I came across this picture sent to me by a client. Christmas 2009, The Smith family in Westport, CT became the proud owners of one of our trained Smiling Dog puppies. As timing would have it, Smiling Santa himself was able to suit up and make the delivery himself. On a personal note, once in your lifetime I encourage everyone to don an ill-fitted Santa suit and go for a drive early Christmas morning. The reactions are priceless. Having already opened presents, the Smith children and other assorted relatives were basking in the glow of yet another successful Christmas – when the doorbell rang. 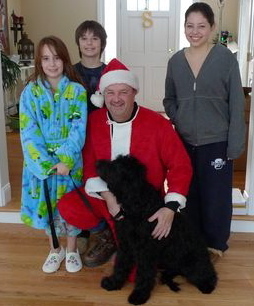 The parents quickly duct taped the kids to the couch and ran to the door to meet Santa and Jack. Santa handed mom the leash and she confidently walked Jack into the family room to meet the kids that would spoil him and sneak him table food for the rest of his life. It was a great morning for Jack and The Smiths… for Santa too.